THINK OF the Great Frozen North as a gigantic white t-shirt draped across the top of the world. Just as that attire would help you chill out under a hot summer sun, the massive "permanent" ice and snow of the Arctic region helps cool Earth's overall temperature by reflecting sunlight back out into space. Fresh snow reflects up to 90 percent of sunlight's energy or, in scientific terms, has a very high "albedo"—the Latin word for "whiteness." 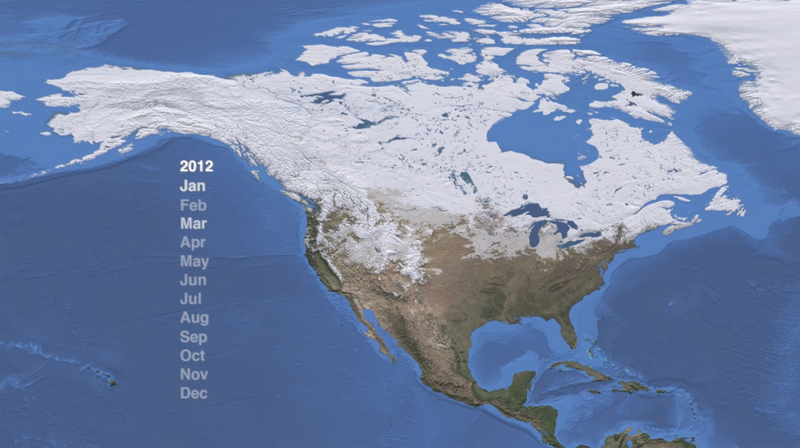 North American snow cover from July 2009 to January 2012, from an mp4 movie of albedo change. Courtesy NASA Goddard Space Flight Center. But increasingly, the Arctic t-shirt is fraying around the edges and exposing darker land and ocean waters that absorb the sun's heat. And in a vicious self-perpetuating cycle, this "albedo feedback" hastens the melting, which further lowers the albedo, which causes more melting, and so on. The feedback cycle contributes to the dramatic reduction in Arctic sea ice cover that has been detected by satellites recently; all six years with the smallest area of sea ice at the end of the melt season have occurred since 2007, with 2012 marking a new record low. Whereas the juggernaut of diminishing Arctic albedo is highly visible, much remains unknown and invisible about the role albedo is having on our changing climate. 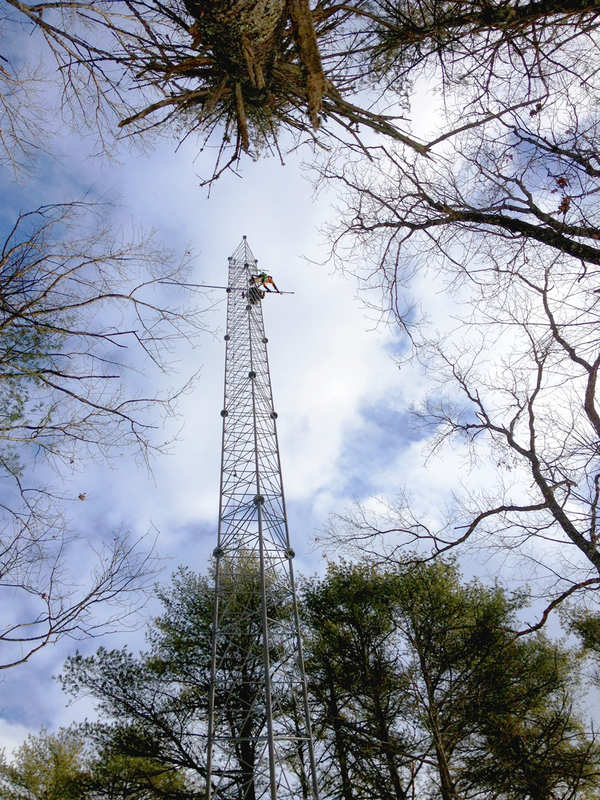 Scientists, including those at UNH and within EOS, are investigating how the reflectivity of surfaces—from forest foliage to agricultural fields to suburban backyards—is having an impact on local to regional to global climate. One of the goals of such research is to improve climate change models and, therefore, improve the ability to look into the future to prepare for and adapt to a changing planet. And albedo research is a core aspect of the current EPSCoR Ecosystems and Society investigation involving EOS and other UNH scientists and collaborators around the state. Researchers are making albedo measurements using aircraft, towers that loom above forest canopies, hand-held "albedometers," and taking snow samples that will be analyzed for heat-absorbing impurities and the morphological (and albedo influencing) differences between freshly fallen and well-aged snowpack. Liz Burakowski atop the tower at Thompson Farm. Photo by Michelle Day, UNH-EOS. 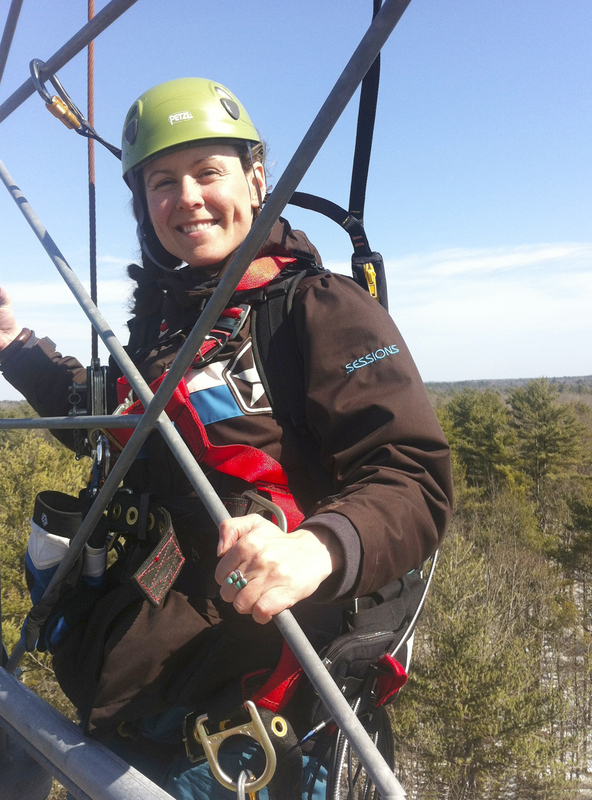 Ph.D. candidate Elizabeth Burakowski's thesis work, funded entirely under the EPSCoR grant, is aimed squarely at eventually answering the question: How much does the phenomenon of albedo contribute to climate change in the Northeast U.S.? "Currently, that's unknown," she says. To help nail that down, Burakowski is working from the ground up making hand-held and tower measurements locally and regionally. Her albedometer and tower measurements made at the UNH Thompson Farm Research Station in Durham will eventually be compared to albedo readings made using a hyperspectral instrument mounted on an aircraft that flew over the farm in February and March to provide high-resolution, wide-scale measurements. In turn, the hyperspectral imagery will be analyzed alongside satellite images taken by the Moderate Resolution Imaging Spectroradiometer (MODIS) onboard a NASA satellite that sees the Thompson Farm landscape in nothing less than 500-meter by 500-meter pixels, or 50 acres per image. Says Burakowski, "MODIS classifies Thompson Farm as 'deciduous broadleaf' even though in the 500-meter pixel there's pasture, a house, a barn, and mixed forest. When I'm on top of the research station's 120-foot tower in winter it's obvious how many white pines there are. It's a very heterogeneous landscape but they're characterizing the entire pixel as deciduous broadleaf because that's mostly what the MODIS instrument picks up." Graduate student Jacki Amante collects snow samples at the UNH Burley-Demeritt Organic Dairy Research Farm in Lee, N.H.
Photo by Luke Barbour, UNH. 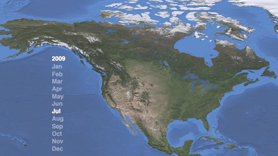 All of which means the albedo calculation derived from a MODIS image is based on some big assumptions that call into question just how accurate that albedo estimation, or "product," is. "What we hope to do is take the hyperspectral data, which is comprised of many 5-meter pixels, and see how well the average of those matches the 500-meter pixel," Burakowski says. "If MODIS is over- or underestimating they'll need to reclassify the pixels based on the finer resolution land cover dataset we'll derive." Jack Dibb, research associate professor and director of ESRC, has done work on the Greenland ice sheet for over 20 years, including recent analysis of how well MODIS is reading the huge, flat, white surface for the albedo signature. 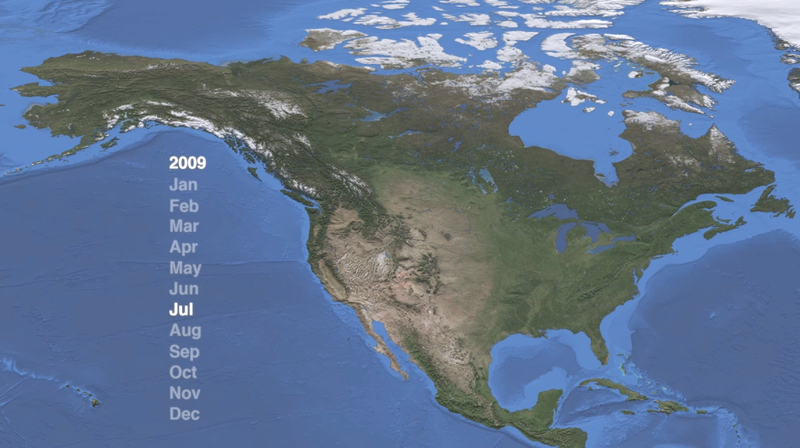 "We and other researchers have validated the MODIS albedo product for simple scenes like Greenland or Antarctica and it's reasonably good," Dibb says. But even in such a "simple" environment, topographic undulations and varying angles of the sun can create shadows and subtle variations in light that confuses MODIS and makes an albedo pixel less sharp. Imagine, then, a landscape like New Hampshire's where there are no ice sheets or even 10,000-acre wheat fields that present MODIS with a relatively bland, easy read. 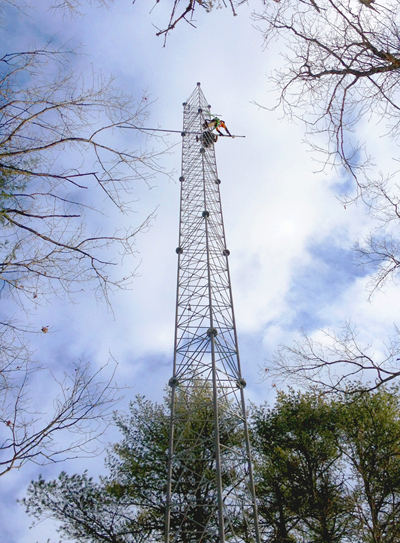 Liz Burakowski and Michelle Day ascend the tower at Thompson Farm to make albedo measurements. Photo by Evelyn Jones, NH EPSCoR. Says Dibb, "The management units in this part of the world are pretty small—a bunch of backyards, a hay field, a tree farm, a clear-cut forest of 20 acres—all these little blocks of land that all look different. How does MODIS reproduce that? We don't know." Referring to Burakowski's work he adds, "But Liz is trying to make the first detailed effort to understand what the MODIS albedo product is really telling us or how good it is for this area." Indeed, Burakowski's work is aimed at eventually improving the capacity of climate models to accurately predict how changing albedo will alter our future climate. 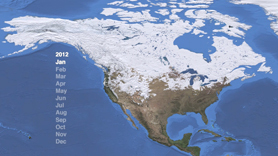 There are specific modules in the climate model that deal with how snow cover evolves over time—an aspect Dibb and master's student Jacqualine Amante are currently working on under the EPSCoR project. Amante is collecting snow samples in the region to ascertain how various chemical compounds, particularly black carbon, or soot, impact albedo. It is timely work; a landmark report released in mid-January showed for the first time that airborne black carbon—from diesel trucks, woodstoves, forest fires, etc.— is second only to carbon dioxide as a contributor to global warming. When soot falls out of the atmosphere and lands on ice and snow it can darken the surface and initiate other physical processes, like changing the shape and size of snow grains, which in turn can have a big impact on albedo. Research Dibb conducted recently at Summit Station on the Greenland ice sheet shows that airborne soot presents a bigger threat and, indeed, the new report also bears this out. What's not clear, however, is whether impurities in snow, like soot, speed up or slow down the changes in the shape and size of snow grains—something Dibb and Amante are investigating. Like Burakowski's research, understanding more fully how snow morphology changes over time, thus changing its albedo properties, will increase the climate models' accuracy at making future climate change projections. Notes Dibb, "As part of the total EPSCoR project effort, we will take this climate model, which Liz's work will have helped us gain more confidence in with respect to albedo, and apply it to a range of possible future scenarios, including what we're most interested in—various options New Hampshire citizens and policymakers might choose between for future land use patterns."